While visiting my mom in Grand Rapids, Michigan, for Christmas, we made several batches of Christmas cookies together. We had always loved holiday baking together when I was little. I had been thinking about making savory cookies, and decided to try cardamom as a flavor in one batch. I added a 1/4 teaspoon, and could barely taste the flavor once they were out of the oven. Then, two weeks after Christmas, on a return trip home, I stopped by a local health food store and bought a large bag of lavender. I had been meaning to try cooking with lavender, adding it to savory dishes. 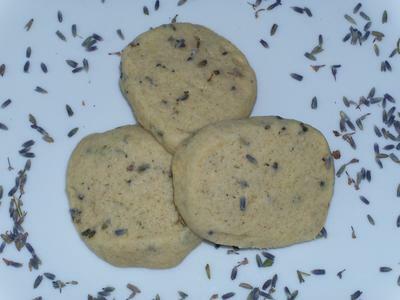 So I decided to make the cookies again, this time with the lavender, and more of the cardamom. The result was delicious! My mom agrees that they are among the best cookies she's ever tasted. They are my new favorite! Sift dry ingredients together. Add butter until texture of pie crust mix. Add egg, vanilla, lavender, and cardamom. Mix together. Cut into 1/4-inch thick slices. Bake at 350F degrees for approximately 15 minutes.